Federal prosecutors are seeking the death penalty for Dzhokhar Tsarnaev for his role in the 2013 Boston Marathon bombing. Three short paragraphs - hand-written, in Russian, on lined, notebook paper - sat atop a stack of old newspapers next to the television in the newly vacant third floor apartment at 410 Norfolk Street. 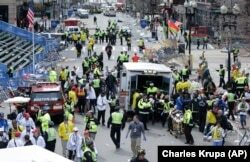 FILE - This April 15, 2013, photo shows medical workers aiding injured people at the finish line of the 2013 Boston Marathon following an explosion. 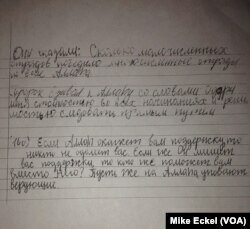 A scrap of paper, featuring Quranic musings, written in Russian and shared with VOA, was found in the Cambridge apartment by a close family friend and identified by the friend as Tamerlan's handwriting. The writing, shared exclusively with VOA, is a glimpse into the mind of the man considered to be the mastermind of the Boston terrorist attack. Nearly 21 months later, the scars of the bombing - psychological and physical - are deep and raw in the Boston area as survivors, witnesses, Americans and Chechens, from Boston and Grozny, have groped to understand the motivations of the Tsarnaev brothers. VOA has retraced some of the key steps leading up to the bombing, interviewing members of the Chechen émigré community and others who had close dealings with the Tsarnaev family. Dzhokhar Tsarnaev is seen in this law enforcement bulletin, distributed in the days after the April 15, 2013, bombing. The best hope, however, for understanding what led to April 15, 2013, lies with Dzhokhar Tsarnaev, whose trial on 30 terrorism and related charges opens Monday in Boston’s federal court just a few miles from the marathon’s finish line. At 755 Boylston St., just a few steps from the finish line of the Boston Marathon, there is little indication of the carnage of the 2013 bombing, except for a small makeshift memorial tied to a narrow tree. Carey McLoud, an owner and manager of the Manchester Firing Range Line, refused to answer VOA’s questions about the Tsarnaev brothers. Tamerlan had also traveled to the New Hampshire coastal town of Seabrook to buy fireworks, and gather gunpowder to fuel the pressure cooker bombs. On February 6, at around 7:40 p.m., Tamerlan stopped at Phantom Fireworks and paid $199 cash for a package called “Lock and Load,” and took advantage of a “buy-one-get-one-free deal.” He left with 48 mortars and the equivalent of eight pounds of low explosive powder, according to prosecutors. On Feb. 6, 2013, Tamerlan Tsarnaev traveled to New Hampshire, to buy fireworks, as part of preparations to build pressure cooker bombs. 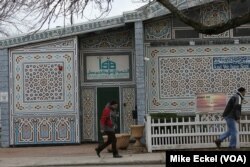 Elders at the Cambridge mosque of the Islamic Society of Boston said the November 2012 outburst by Tamerlan Tsarnaev was the first time anyone really took note of him. Between January and July 2012, Tamerlan spent some of his time in Makhachkala, the capital of the Dagestan region, working with his father Anzor, who had arrived in the region in April. Anzor was newly divorced from Zubeidat, according to the family friend, who asked not to be identified publicly while discussing the Tsarnaev’s family dynamics. Like much of Russia's North Caucasus, Dagestan, shown here in red, has struggled with violence spilling over from neighboring Chechnya. 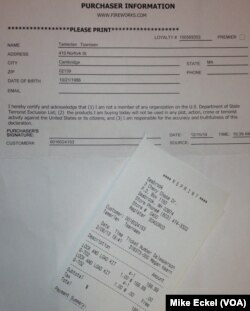 The stated reason for Tamerlan’s trip in January 2012, according to the Russian newspaper Novaya Gazeta, was obtain a Russian passport: Tamerlan held a Kyrgyz passport, the result of his early childhood in Kyrgyzstan, where many Chechens lived after being expelled from their homeland by Stalin in the 1940s. 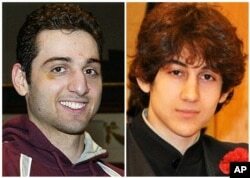 Where Tamerlan (L) saw some success as a boxer, Dzhokhar (R) captained his high school wrestling team. In the United States, Tamerlan had been a show-off from a young age, always seeking attention, the family friend told VOA. He loved to sing, to play violin and to dance. He was smart academically, but he never seemed focused, the friend said: he talked about being an accountant, but he took only a handful of classes at Bunker Hill Community College. Tamerlan was athletic, as well: he trained at a boxing club in Somerville, next door to Cambridge. His boxing career, nurtured by his father Anzor, hit a high point in February 2010 with a regional trophy. Then it petered out. “He didn’t seem to know where he was going,” the friend said. Donald Larking was an older man who became so close to Tamerlan that he attended prayer services at the Cambridge mosque, according to Rosenberg, Larking’s lawyer. Larking also had constant discussions with Tamerlan about politics and espoused dark conspiracy theories about the attacks of September 11, 2001. Through Rosenberg, Donald Larking refused to be interviewed for this article. 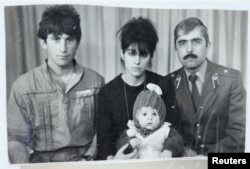 Pictured is Tamerlan (C) Tsarnaev, accompanied by his father Anzor (L), mother Zubeidat and uncle Muhamad Suleimanov (R), in this photo courtesy of the Suleimanova family. “I remember when I saw him on TV… I ran straight to my brother, and said, “Did you see who was on TV?’ He said “Yeah, I saw it,’” Baieva, 21, said. “I was more upset. 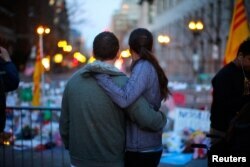 I felt bad for [Dzhokhar] and I felt bad for his parents, everything he put them through. Friends say Dzhokhar Tsarnaev was smart and quiet, always in the shadow of his older siblings. Unlike with Tamerlan - the trip to Russia, the mosque outburst, the initial FBI investigation - Dzhokhar’s involvement in the attack was even more baffling. According to friends and acquaintances, he never elicited attention or worry prior to April 15, 2013: not from neighbors or friends, not from school, not from law enforcement. 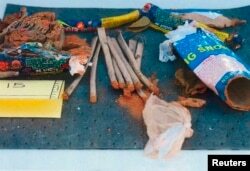 Fireworks found inside a backpack belonging to Dzhokhar Tsarnaev are seen in a handout photo released by the FBI, May 2, 2013. The night of April 15, Dzhokhar sent a friend— the son of a prominent Boston-area Chechen émigré— a text message asking him if he was at the marathon and was OK.
For victims, for friends of the Tsarnaev family, for Chechen immigrants, for marathon runners, for arguably just about everyone in Massachusetts, the trial scheduled for Monday is likely to be a riveting spectacle. 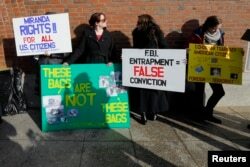 FILE - Demonstrators asserting that evidence in the Boston Marathon bombing was fabricated stand outside the federal courthouse ahead of a pre-trial conference for suspect Dzhokhar Tsarnaev in Boston, Dec. 18, 2014. For some, it will be a chance at vengeance and punishment for a young man whose seeming potential crashed to a halt on April 15, 2013. For others, it will be a chance at learning something more about why a laid-back, average, 19-year-old college student decided to participate in a horrific attack on bystanders celebrating a beloved sporting event. “I want to know why he did it. I want to know why he would go out of his way, what did he need when he already has everything,” said Baieva, the childhood friend. On December 18, Dzhokhar appeared at the John Joseph Moakley United States Courthouse, on Boston’s waterfront, his last appearance before the formal beginning of his trial. It was his first public appearance since July 2013, when, still visibly wounded from the manhunt, he told the court he entered a plea of not guilty. 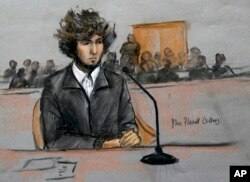 A courtroom sketch depicts Dzhokhar Tsarnaev in federal court in Boston, Massachusetts, December 18, 2014. Federal prosecutors have indicated they will seek the death penalty if Dzhokhar is convicted. His defense lawyers are expected to seek leniency from the jury, arguing that Dzhokhar was an accomplice, but decidedly under the sway of his older brother. Defense lawyers have also made a flurry of last-minute court filings, seeking to either delay the trial or move it out of state. A filing last Monday by Tsarnaev’s lead lawyer, Judy Clarke, suggested that the defense was trying reach a deal with the prosecution: possibly a guilty plea in exchange for a life prison sentence. “If the government remains unwilling to relent in seeking death, and the case therefore must be tried, the defense is asking for nothing more than a trial that is fair,” she wrote. 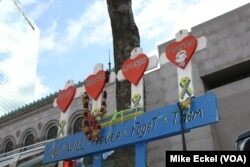 A couple embraces at a memorial on Boylston Street to the bombing victims, April 21, 2013. The trial portends renewed grief not only for the victims of the bombing. For the refugees of the Chechen wars and oppression, who came to the New England over the past two decades, settling in the United States was a chance for them to rebuild a semblance of peace and prosperity. The Boston Marathon bombings shattered that dream. Upon reaching the United States, “for the first time in my life I felt that I, my kids, my family – that we are safe and happy here. I prayed for America every evening,” said Madina Khadzhimuradova, the Tsarnaev family friend.